At Barkway Karate Club we teach a traditional style of Karate called Shotokan, created and developed by Master Gichin Funakoshi in Okinawa, Japan. Karate translates as "empty hand" in reference to the non weapon fighting system devised which used hands and feet as swords and knives. We believe Shotokan Karate benefits both body and mind, promoting health and well being and developing characteristics which assist in all areas of life. Our regular lessons include training of the basics (kihon) sparring (kumite) and forms (kata) with practical applications (bunkai). In addition we include self defence training and pad work drills and agility activities to develop techniques, movement, fitness and core strength. 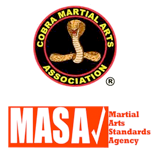 Barkway Karate is a member of C.M.A.A and affiliated to the Martial Arts Standards Agency. Copyright © 2012 - Barkway Karate Club. All rights reserved.